I keep having to refer back to how I have done this in the past because it is not obvious within Delicious how to do this, unless you start to dig around the developers documentation. So, I am posting this here in case anyone else needs to get the RSS feed for a Delicious tag. I’ll get to why you may want to do this in a minute, but first the meat of the post. 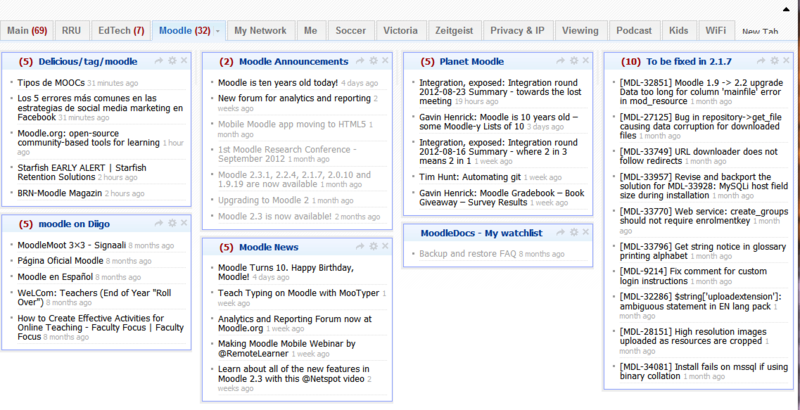 That will pull an RSS feeds of the latest 10 resources tagged with the keyword “moodle”. If you want more or less resources, you simply change the number 10 to whatever number you want in your feed. Now, why would you want to do this? Well, one of the things I like to do is monitor Delicious for new items that are tagged by the community, but I don’t want to have to go to Delicious to see what is newly tagged for whatever topic I am tracking. What I like to do is pull an RSS feed into a site I already check everyday (actually multiple times a day) – my Netvibes page, which is my personal dashboard. The widget is in the top left corner of my Moodle tab, which is in context with all the other Moodle resources I am tracking on the web. Now whenever someone tags a resources with the keyword “moodle” in Delicious, it will appear in this widget, in context with all the other Moodle resources I am gathering. Getting a RSS feed for a Delicious tag by Clint Lalonde is licensed under a Creative Commons Attribution 4.0 International License. Thanks SO much for this useful article. I'm using MailChimp to drive an RSS feed from Delicious into an automated daily newsletter. I have it set up so that anything I tag with two specific keywords goes to an RSS feed. This works fine but I want the comment (Delicious description) to appear in the newsletter too. Do I need to change the RSS to something specific to include my comment? Sorry – am new to all of this! Hmmm. Looks like Delicious is fiddling with their site. I see that they have a new design that they are rolling out (demo.delicious.com). Wonder if they are again mucking around with the RSS feeds? Might have to go hunting again & update this post. Super useful. Probably the main thing lost in the changeover(s) in the past few years… Thanks for getting to the bottom of it! No problem. Glad it was useful.